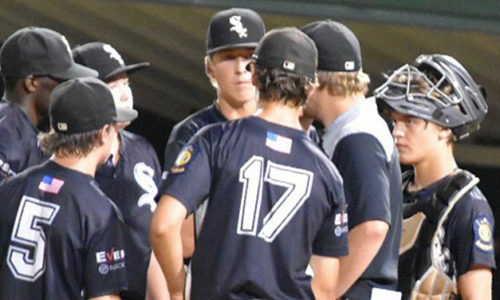 MEMPHIS — Blaine Sears put a stop to a rally by the Houston High School 15-and-under extended-season team and the Bryant Black Sox 15-and-under American Legion team captured a 3-2 win in pool play at the annual Keith Hagan Memorial All-America Classic on Sunday. The win made Bryant 2-1-1 in its pool going into the pool finale against the Batters Box showcase team Sunday evening. Aaron Morgan drove in two of Bryant’s runs and Garrett Wilson knocked in one. Each had one of the Sox’ five hits. Houston had rallied from a 3-0 deficit to score twice in the bottom of the sixth after Wilson had shut them out over five frames. In the sixth, a single, a double and a wild pitch had produced a run for Houston. A walk led to Sears coming on in relief. He induced a grounder to Noah Davis at short that resulted in a force at second. The Sox then turned a doubleplay to keep it 3-2. In the seventh, Davis and Christian Motes earned two-out walks but were stranded. Sears then set down Houston in order in the bottom of the seventh. The Sox took a 1-0 lead in the opening inning. Ryan Riggs doubled to left-center and, after Brayden Lester drew a walk, Davis moved runners to second and third with a groundout. Wilson belted a double that plated Lawson Speer, who was the courtesy runner for Riggs, the Bryant catcher. Wilson set down Houston in order in the first then worked around a one-out single and two-out walk in the second. In the top of the fourth, the Sox scored twice. Slade Renfrow drew an inning-opening walk, took second on a wild pitch and third on a bunt single by Tyler Bates. Bates stole second, setting the table for Morgan, who cracked a single up the middle to drive in both runners. Again, Wilson worked around a single and a walk in the home fourth then set down Houston 1-2-3 in the fifth. The Sox couldn’t get anything going in the fifth or the sixth.